Happy August! As the last month of summer, August brings with it a time of sunshine, summer days and of course, preparing your family for the upcoming school year. As the days begin to get shorter, you might feel like the opportunities for summer activities are starting to dwindle. However, you could not be further from the truth. 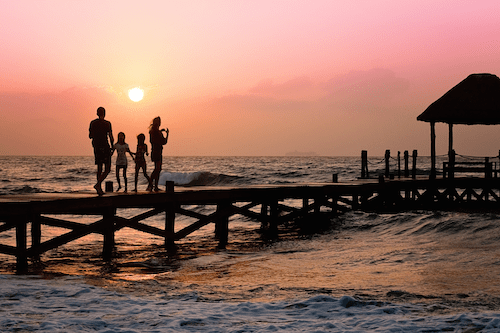 In fact, the month of August recognizes National Family Fun Month, which means it’s the perfect time to get out in the warm summer heat and celebrate family-fun activities together. National Family Fun Month was created as a reason to embrace and make time for extra fun with your family this summer. If you want to take advantage of the last summer days and commemorate Family Fun Month with your loved ones, here are four ideas to celebrate this August. As summer comes to a close, use the month of August to find and enjoy as many activities outside as possible with your family. For instance, try packing a picnic to go benefit from an evening in the park. Or, take a trip to your local amusement park for a day full of fun and laughter. You could even consider going on a camping trip to really embrace the last few days of heat this summer. August is the perfect month to take as many opportunities to be outside as possible, whether it’s swimming in the pool or going putt-putting. In just a few short weeks, fall will be here, followed quickly by winter, and the time to be outside will come to a close. So, use National Family Fun Month as an opportunity to embrace family fun activities out in the sun. Lots of businesses and organizations will offer a variety of different classes over the summer months. While some of these might just be for children, there are also those that get the whole family involved. Check in your community for any classes you could do together with your kiddos. For instance, why not take a cooking class at your local grocery store, or a woodworking class at a hardware store? You could also check with local nonprofit organizations and see what types of classes they might offer, such as art or a writing workshop. Not only can your family have a ton of fun by attending these classes, but you can also learn something new together in the process. 3. Go to events in the community. Speaking of attending classes, as summer winds down to a close, so do some of the events going on in the community. Take advantage of the last few weeks of summer by going to as many community events as possible with your family. Perhaps there’s an upcoming county fair, a street market or even an outdoor concert put on by a local business. Many of these events are low-cost admission, or might be completely free altogether for a family. Keep up to date and check which events are going on in your community, then celebrate National Family Fun Month by attending them with your loved ones. 4. Get involved with volunteering. Finally, one of the best ways to have fun this August and teach your children valuable life skills is by getting involved through volunteering with your community. Learn about an important cause or organization near you and see how you can give back by volunteering. Whether you serve food at a mission, donate clothes to an organization or pass out flyers for an event, volunteering together as a family can be a fun and rewarding experience as you strive to live an altruistic lifestyle. Not to mention, you can also make a genuine impact on those people living in your community. See what volunteering opportunities are near you and get involved by serving others this Family Fun Month. Family Fun Month is the perfect opportunity to celebrate the end of the summer before your children head back to school. Take advantage of these creative and altruistic ideas in order to have the best Family Fun Month possible this August.